Much is made of the tax rate that U.S. corporations pay (a 35% statutory rate, higher than in many other countries, though U.S. firms often take advantage of tax breaks to reduce their effective rate). But less is heard about the tax rate of “pass-throughs,” the partnerships and other businesses whose income is taxed at the same rate as personal income, primarily because there is no simple number to look up. 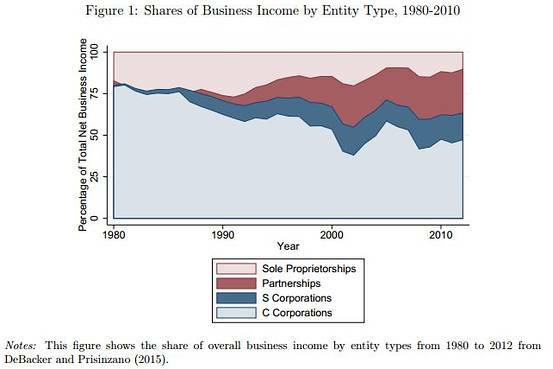 The share of overall U.S. business income by entity types from 1980 to 2012, as presented in a paper by economists with the U.S. Treasury and others at a National Bureau of Economic Research paper in Washington on Sept. 24, 2015. Why this matters: Not so long ago, corporations dominated. In 1980, only 20.7% of all business income was earned by pass-through entities; in 2011, the share had grown to 54.2%. So a band of number-crunching economists at the U.S. Treasury and some academic partners, with access to far more data than outside researchers can see, set out to answer two simple questions: Who is getting all this partnership income? And what tax rate do they pay? They offered their answer Thursday in a paper presented at a National Bureau of Economic Research conference in Washington. *Pass-through business income is even more concentrated among the richest Americans than traditional corporate profits. “Overall, 69% of pass-through income earned by individuals accrues to the top-1%. Corporate income is similarly concentrated, but other business income (typically considered very concentrated) is substantially less concentrated. For instance, only 45% of C-corporate income (as proxied by dividends) accrues to the top-1%,” they report. * The average federal income tax rate paid by individuals who report pass-through business income was 19% in 2011. In part, that’s because so much of that income is considered capital gains or dividends, which are taxed at preferential rates. That rate is much lower than the average rate on traditional corporations, which the authors estimate at 31.6% in 2011. And that is why so many businesses–some of them very big–have organized themselves as pass-through entities instead of traditional corporations. * Across all business entities except for sole proprietorships, the average tax rate of U.S. business income in 2011 was 24.3%, they estimate. That’s lower than is often assumed in debates over corporate tax reform. “We believe this estimate to be the most comprehensive estimate available of the average tax rate on U.S. business income,” the economists write. * “The migration of business activity out of the C-corporate sector and into the pass-through sector has likely substantially reduced U.S. tax revenue,” the economists conclude. If pass-through activity had remained at the (low) level of the 1980s, then the average tax rate on total U.S. business income in 2011 would have been approximately 28% rather than 24%, and tax revenue would have been at least $100 billion higher. * Even with access to tax returns, the Treasury economists couldn’t trace all partnership income to the ultimate owner or originating partnership because businesses have created such complicated mazes (often designed specifically to reduce their U.S. taxes). “Our inability to unambiguously trace 30% of partnership income … underscores the concern that the current U.S. tax code encourages firms to organize opaquely in partnership form in order to minimize tax burdens,” the economists conclude. These findings, based on hard data far more comprehensive than in any previous work, show, among other things, why corporate tax reform is so tricky. A narrow focus on traditional corporations will be tough and counterproductive because so much business income now goes to these pass-through entities. But any tax reform that essentially seeks to lighten the burden on big corporations by raising the tax rates paid by partnerships and other pass-throughs is sure to prompt a huge political fight, led by the well-paid Americans who are enjoying very low tax rates on their business income. The research also suggests that anyone who wants to use the tax code to restrain the widening gap in income inequality–as many Democrats advocate–has to look at the way pass-through entities are taxed.